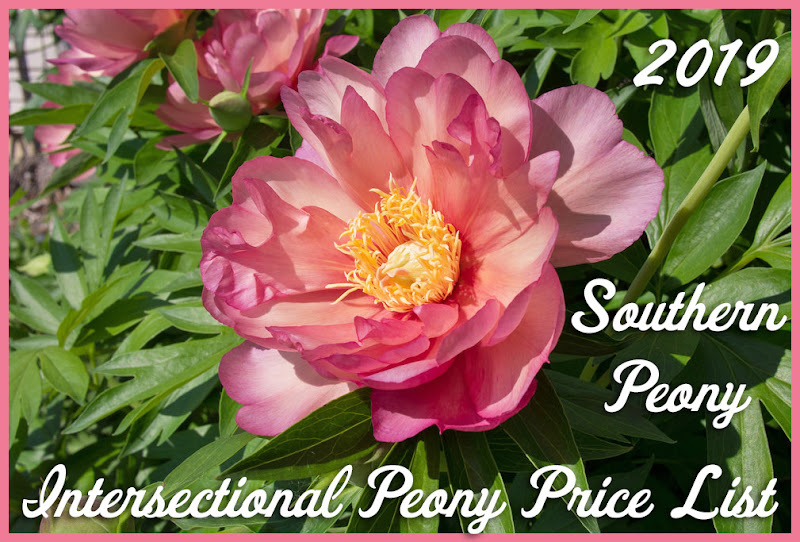 It's that time of year, peony planting season, and if you'd like to get your peonies off to a great start, planting them in the correct place will get them growing on their way to a bush full of blooms. For home gardeners, there are definitely places you can grow peonies that will keep them blooming year after year. These are usually 'prime' spots that get plenty of sunlight and adequate water too. 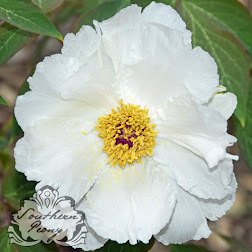 Herbaceous peonies do not need shade no matter what growing zone you are in. 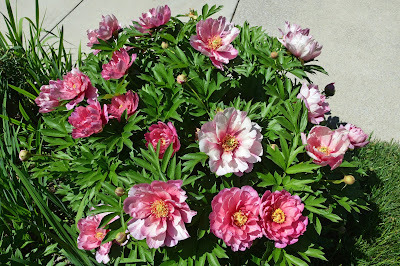 The more shade peonies are grown in, the less blooms they have, period. So if you want more blooms and larger plants year after year, consider planting a peony (or several peonies!) in one of these prime locations (assuming these locations receive full sun in your yard). Also don't be disappointed if your peony doesn't look this good the first spring. 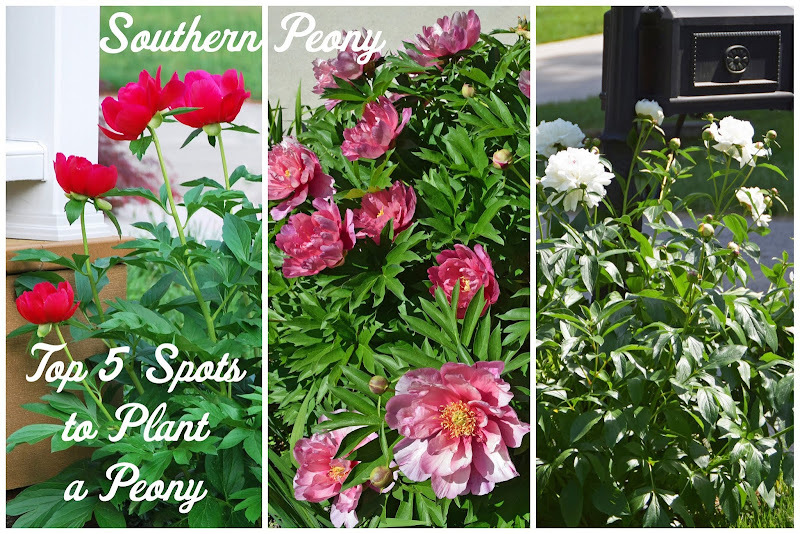 All of these peonies have been growing in these locations for 2-3 (or more) years before looking this good! So with peonies, patience (and location, location, location) are key. Peonies grow very well near decks and patios (as long as your deck or patio is in the sun). The extra water that runs off from the deck or patio benefits any plants that are growing nearby. Also having shaded ground near the peony helps to keep the soil temperatures a bit more stable, protecting the plant from extreme temperature swings. 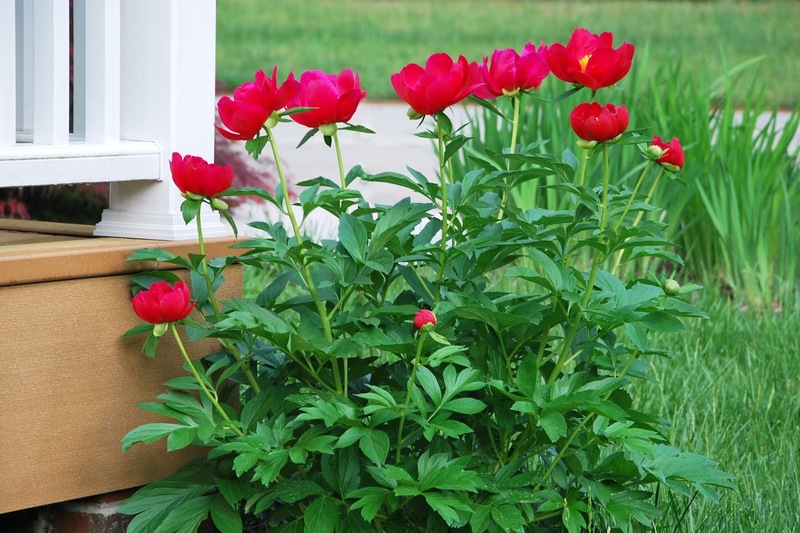 Decks and patios are great places to plant a peony, plus you can enjoy them up close from your own outdoor haven (and your outdoor lounge chair)! 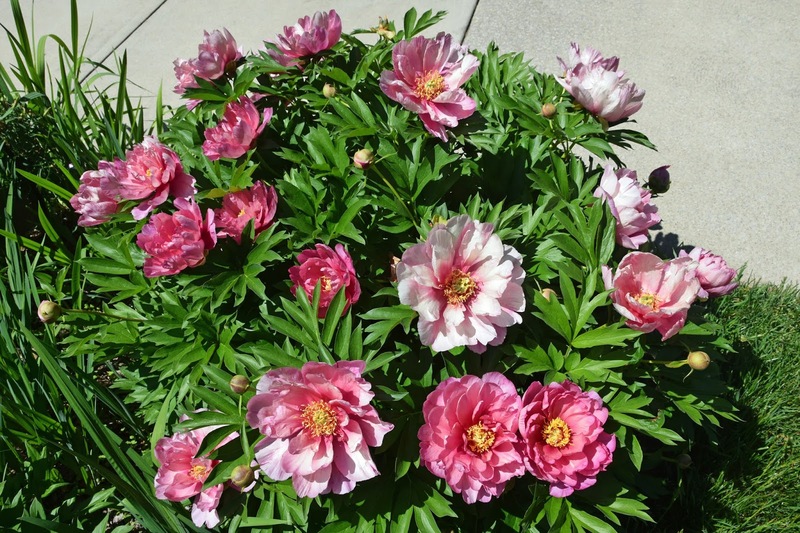 Sunny sidewalks are the perfect place to grow a peony. The peonies love not having to compete with any trees or shrubs. So plant them along your driveway or up the sidewalk to your front door. Greet your guests and visitors with some big, bright peonies. They will give your friends and family a smile (and you too every time you come home). Planting them on a walkway gives you the chance to take a sniff every time you walk by. Growing peonies next to your house is a perfect spot (as long as there are no trees next to your house). The sides of the house create a micro-climate for the peonies that is usually more moist (because of the rain runoff) and more stable in soil temperatures (because of the protection from the house). Instead of building your garden around the edges of your yard in, trying building it from the edges of your house out. You'll be surprised with the results! 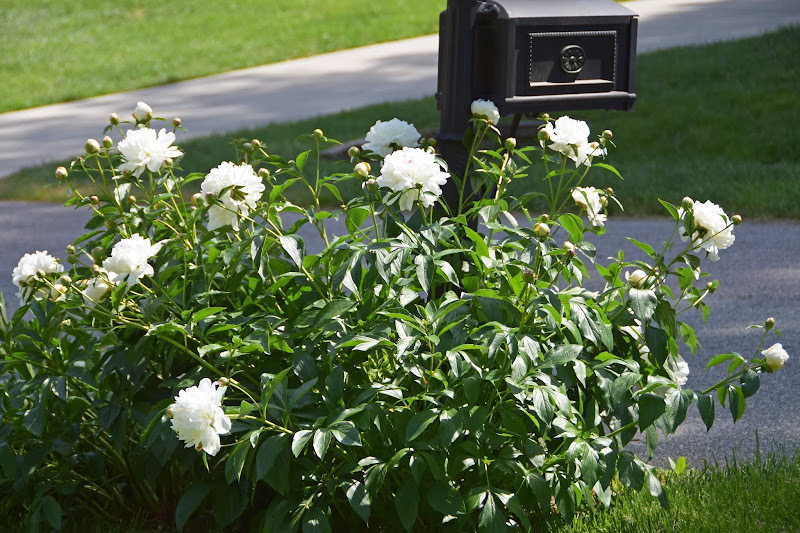 Growing your peonies near your house will give you larger and more abundant blooms than in drier parts of your yard that are too close to trees or shrubs. If none of those spots work for your yard because they are all already filled with trees, large shrubs, and too much shade, then it's time to cut down some trees!!! Okay, kidding aside (but that may be necessary for some), the default spot to plant a peony is right in the middle of your yard. Yes! Just take out a large patch of that grass you don't really want to mow anyway and convert it into a mulched planting bed. The peonies will be happy because they have no competition whatsoever, tons of sunlight, and a nice top dressing of mulch to keep their roots cool in the summer. Just keep in mind that no matter where you plant your peonies, it will take a few years for them to become established, but the wait will be worth it!!! Happy Peony Planting!